Untitled - Work in Progress, Acrylic on Canvas, 12 x 12 x 1.5"
As you can see this one has a long way to go. But I wanted to show all five individually that I’m currently working on. Still flying by the seat of my pants on these. I started to type “paints.” Yeah. That works too. I promise, promise promise to show the next stages of all of these, with before and after pics. This weekend has been spent mostly outdoors. The weather has been wonderful for working in the yard, raking leaves, covering up my beds with leaves for future plantings, and poring over bulb and seed websites. I’m such a complete beginner with flowers. I love growing things you can eat, but I also want some flowers. And there will be herbs. Always herbs. We have a lot of squirrels and chipmunks, and I’m reading that they will eat your bulbs if you can’t outsmart them with chicken wire or cayenne powder, etc. But the good thing is that they don’t like daffodil bulbs! Guess what my first bulbs are going to be. I’d just as soon not go to battle with chipmunks. They are so danged cute. But sadly, one of my dogs killed one last week before I knew what was happening. A chipmunk has to make a living too. What is a turkey shoot? I’m not sure I want to know. 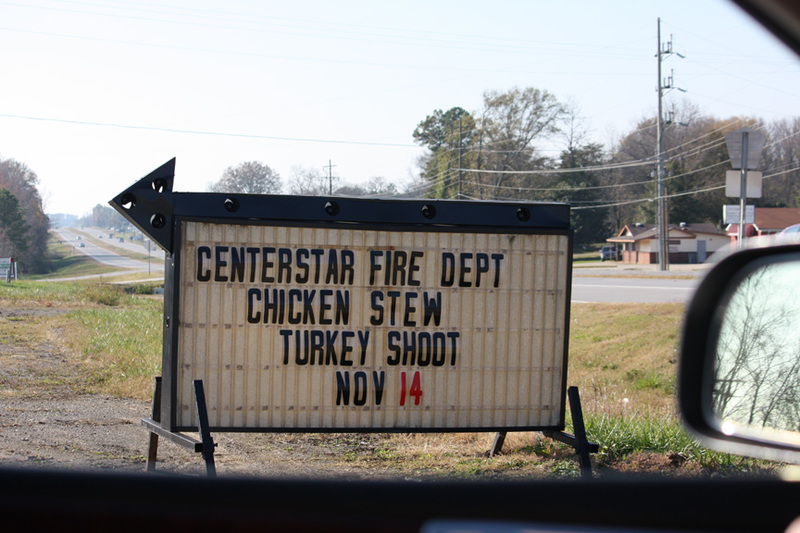 There was a turkey shoot at the fire station in my neighborhood yesterday. I didn’t know it until after the fact when I saw this sign. I wondered what all the gunfire was about yesterday. Chicken stew is a big thing around here too, for fund raisers and community events. It’s the same as Brunswick Stew, but chicken is the only meat. I make a mean chicken stew myself. I’ve enjoyed seeing your ‘work in progress’ pieces. Can’t wait to see more. Thank you, Jane. Knowing everyone’s watching will possibly keep me working on them! Turkey shoot? Sounds dreadful! But that bright blue rocks. Reminds me of lapis beads. Cath, I had to look it up on Wikipedia, even though I grew up in these parts. But I lived “in town” and don’t know everything that goes on out in the country (probably a good thing!) In the olden days they really did shoot turkeys. But now they shoot targets and the winner gets a frozen turkey. I’ll remember you when I proceed with this painting and make sure I keep some of that blue passage. A turkey shoot…..they use shotguns and paper targets in order to win a frozen turkey. Sounds awful, doesn’t it? But it’s all in fun…..those country boys love it. Dot – so I hear! My dogs went crazy when they started hearing the shotguns. I thought someone was hunting a little too close to the neighborhood. Turns out it was at the fire station just two blocks away. They have a large property with a park attached. So I’m guessing they were being mindful of safety concerns. I hope. I will keep going with these paintings this week. We’ll see. Martha, I’m an Alabama native- from the “city” not the country, although I still know what a turkey shoot is. They’re always just before Thanksgiving….as you have found! I always enjoy seeing your work in progress. 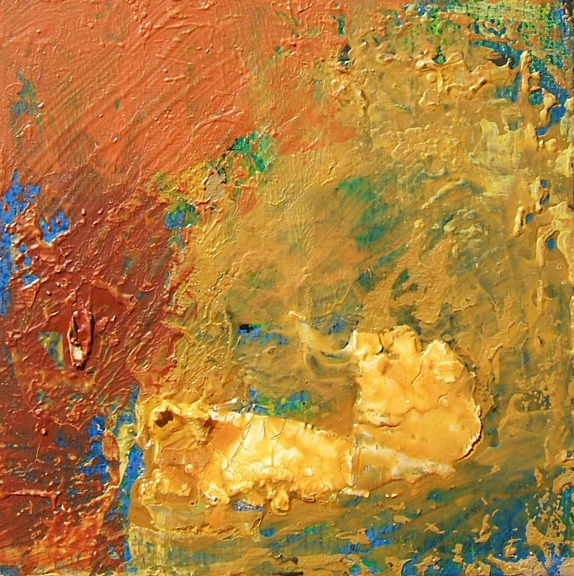 This one reminds me of the American desert, and that deep, bright blue western sky. I guess you can tell where my mind is lately- nature and travel! Well Stephanie, I can certainly see the desert reference with these colors. Yeah, I don’t know how I escaped knowing about turkey shoots. Of course I heard the term all my life and never paid it much attention. I got a chuckle out of the turkey shoot and chicken stew references. That photo could have been taken right in my own (turkey) neck of the woods. I just had to get a picture of that sign. It made me chuckle too.